Studies continue to show that email marketing drives the highest ROI across digital marketing efforts, so ignore the myths that say email marketing is dead. Make sure you’re giving this valuable channel the proper love and attention in all of your digital marketing efforts. To make sure you’re producing the strongest email marketing channel returns, it’s important that you and your digital marketing team are fluent in the language of all things email-marketing related. To ensure all the terms are fresh in your memory, we’ve compiled 55 definitions you should know like the back of your hand, conveniently broken down into three sections. 1) Email Campaign: An email marketing effort that involves one or multiple email messaging programs designed for a single goal, that can range from lead nurturing, lead generation, customer engagement, and more. 2) Email Client: Often referred to as webmail, but it can be a hardware processor too, an email client is a computer program used to read and send electronic messages. Email clients can use a number of protocols to send and receive emails via email servers. The messages are either stored only locally, or emails and folders are synchronized with the server. 3) Bounce Rate: The rate at which your emails are not delivered (# emails bounced / # emails sent). There are two types of bounces, hard and soft, both of which are defined later in this glossary. An acceptable bounce rate is usually considered less than 5%. 4) Hard Bounce: When an email message cannot be delivered to an email address, it’s called a bounce. It’s considered a hard bounce when an email message is permanently rejected: the message cannot be delivered to a certain email address because the address doesn’t exist or it’s invalid. 5) Soft Bounce: When an email soft bounces, it’s because a recipient’s email inbox is full, a server was down, or there’s something wrong with the email you sent (for example, it could be too large of a message). 6) Email CTR%: This is your email click through rate percentage rate. It’s the number of people uniquely clicked on a certain link in the email, divided by the total number of recipients who opened the email. 7) Email CTC%: This percentage is your click to conversion rate. It can be understood as how many acquisitions/ sales/customers sign ups you got divided by the number of clicks that the email campaign delivered. 8) Email ROI: Email return on investment. How much value did you get back from the money you spent on your email campaigns. 9) Email Clicks Per Delivered: This is a percentage measure of the number of clicks on an email divided by the total number of emails delivered to any given email inbox. 10) Clicks Per Open Percentage: This metric describes the amount of clicks on an email divided by the the amount of emails opened. 11) CPM (Cost Per Thousand): In email marketing, CPM commonly refers to the cost per 1000 names on a given email address rental list. Buying email lists is generally never recommended. 12) Open Length: How long a person keeps an email open until they close out of it. 13) Email Call-to-Action (CTA): A CTA found in the body of an email designed to cause a target to click a button or a link usually to set an appointment, request more information, download a whitepaper, sign up for an event, etc. 14) Email Broadcast: An email broadcast is scheduled to be sent at one specific time to a to a specific segment (list) group of targets (contacts) present in it at that time. 15) Email Alert Message / Triggered Email: An email that is sent immediately after an event happens: A form is submitted by a prospect and a thank you email is immediately sent to the prospect. Similarly an email is deployed to the sales person with the content of the form. 16) Email Sponsorships: When a company buys advertising space in an email newsletter or sponsors a particular article or pays to inject the ad in the email message body. 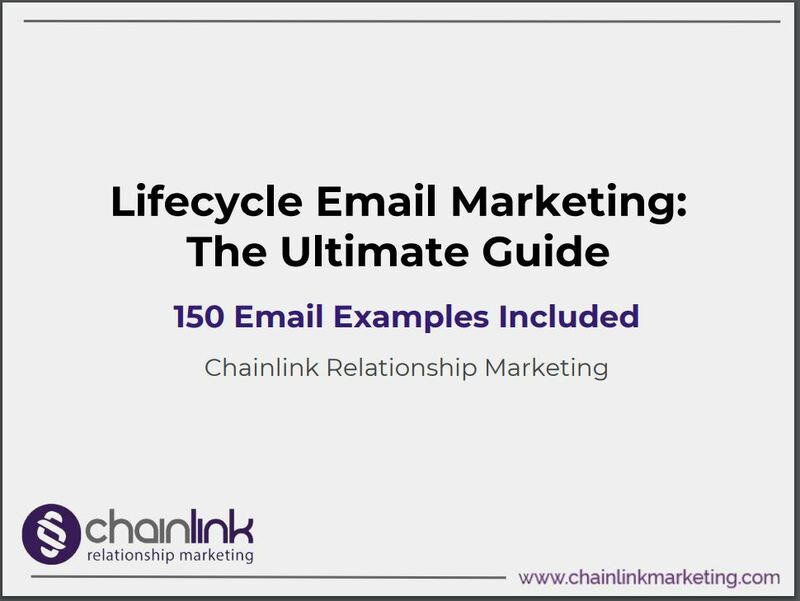 17) Email Retention List: This is a permission based list of prospects and customers that that have opted-in to receive your email marketing efforts in the future. This list is highly valuable as its targets who have raised their hand in the past and can be identified as prospects vs cold leads. 18) HTML Email: It’s when an email message is formatted like a web page (with colors, graphics, table columns, embedded media, etc). When you send an HTML email, you have more creative liberties with the design. 19) Plain Text Email: An email sent without HTML. You should always give your recipients the option to read emails in either HTML or plain text for better readability across email clients and devices. 20) Email Personalization: Adding elements to your email that are personalized based on information you already know about them. It could refer to addressing the recipient by name, referencing past purchases, or other content unique to each recipient. 21) Dynamic Personalization: When emails are dynamically updated with personalized content, and triggered automatically based upon specific interactions. For example, three different customers will receive three unique email responses based on their behavior. For example, Customer A opened and engaged with the email, while Customer B ignored it, and Customer C sent it to spam. They will receive dynamically personalized emails as a result. 22) Viral Email Marketing: When an email’s content is so desirable that the recipients share it with their friends and family and encourage organically increase the emails visibility. 23) Segment: A Single “list” of targets grouped together by meeting specific criteria established through logical comparisons of both profile and behavioral data. 24) Static Segment: A segment that does not add or remove targets after it is created when outside targets meet the criteria at another time, or included targets fall out of criteria because of data change. However, targets can still be unsubscribed, suppressed, blacklisted. 25) Dynamic Segment: a segment that grows and shrinks as more or less targets meet the criteria. 27) Sender Score: A Sender Score is basically a reputation rating from 0-100 for every outgoing mail server IP address. Mail servers check your Sender Score before deciding what to do with your emails. 90 and above would be considered a strong score. 28) Physical Address: This is the sender’s business street address. It’s frequently found in the footer of an email. Its inclusion is a legal requirement for all email marketing. 29) Signature File: A small block of text (or tagline) at the bottom of an email message that reveals information about the sender (i.e. business name, physical address, phone number, and email address). 30) Single Opt-In: A single opt-in list is created when users sign up for email communications, but don’t confirm the action. This means they can be signed up for a list by someone else, and as such is not a recommended way to build a healthy email marketing list. 31) Double Opt-In: The recommended method of building an email list, it requires subscribers to confirm their opt in by clicking a link in a confirmation email or responding to the confirmation email in some other way. 32) Spam: An email (or multiple emails) sent to someone who has not opted-in. An alarming amount of email is spam, so there are practices, services, and laws to police it. 33) CAN-SPAM Act: This is an anti-spam email law that requires the Federal Trade Commission to issue regulations “defining the relevant criteria to facilitate the determination of the primary purpose of an electronic mail message.” It applies almost exclusively to commercial emails. 34) Spam Cop: The spam police are paid spam services that are hired to plant emails to trap spammers. 35) Spam Trap: An email address that was once valid, but no longer is. If you email this address, you’ll receive a hard bounce notice. When the mail server sees consistent traffic going to the dead email, however, they can turn the email into a spam trap. It will stop returning a hard bounce for the known bad address, and instead accept the message and report the sender as a spammer. 36) Honey Pot: Planting a “honey pot” is a sneaky, clever tactic to fight against spam. Basically, it’s an email address a spammer harvests and emails, that identifies that the spammer. 37) Filtering Emails: This filtering tactic prevents the receipt of certain emails based on factors such as the sender, subject line, or content of an email. It’s often used to fight against spam. 38) False Positive Email: A false positive is when an email should be able to be delivered but it’s wrongly identified as and filtered as spam. 39) Opened but not clicked (or visited or submitted): Target opened the email but did not click a link in the email, visit the emails corresponding landing page, or submit a corresponding form. 40) Unsubscribe Button: The ability for a target to click a link to a personalized page where they can confirm their unsubscribed status. A single opt-out unsubscribe button is only one that should be used. 41) Transactional Emails: Emails sent by a platform usually based around notices (lost password, confirmation of purchase etc.) Chainlink could also power transactional emails through the API which as events happen in other systems and sites could pull in target data and segment it into a dynamic list that is working with a recurring email. 42) Blacklisting: When an email is bounced too many times, it becomes blasted and will not be attempted to send to again. 43) Whitelisting: Updating DNS (Domain Name System) records and using DKIM keys to prove to internet service providers and email clients that the emails being sent on your platform have the authority to say they are being sent from the domain they are showing. 44) IMAP: Stands for “Internet Message Access Protocol” and is pronounced “eye-map.” It is a method of accessing email messages on a server without having to download them to your local hard drive. 45) Reverse DNS: There are many security measures that your domain needs to pass in order for your emails to reach your clients’ inboxes. Reverse DNS is the biggest deliverability killer, as almost all mail servers use this method to verify incoming domains. 46) SPF: Short for ‘Sender Policy Framework’, it’s a DNS (Domain Name System) record that says on whose behalf an IP or domain sends email. 48) DNS: DNS stands for the system (Domain Name System) that catalogs every domain and IP address on the Internet. It’s basically the central database of the Internet. 49) DNS Record: DNS records are basically mapping files that tell the DNS server which IP address each domain is associated with, and how to handle requests sent to each domain. 50) IP Address: An IP address is designed to allow a computer to communicate with another computer or Internet-enabled device. IP addresses facilitates the communication of billions of devices that are Internet-connected and makes them capable of being pinpointed and differentiated from each other. 51) IP Reputation: The amount of bad/bounced/spammed emails sent from a certain sender’s IP address negatively affects its reputation. If it gets bad enough, Internet Service Providers can throttle delivery or blacklist certain emails from delivery completely. 52) IP Warmup: Sending a progressively increasing number of emails out of an IP address in order to build the IP’s reputation. 53) Dedicated IP Address: In the context of email marketing, a dedicated IP refers to an IP address from which only you send email. 54) Shared IP: A less costly option than a dedicated IP address, it is an IP address from which many people send emails. Reach out to us to learn more about how we can help your business grow using email marketing. We’d love to give you a free consultation.